Lot Detail - Frank McCool's Circa 1945 Toronto Maple Leafs Game-Worn Wool Jersey with Family LOA - 25+ Team Repairs! Frank McCool's Circa 1945 Toronto Maple Leafs Game-Worn Wool Jersey with Family LOA - 25+ Team Repairs! 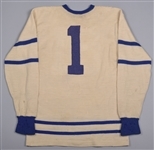 The first goaltender to record an assist in NHL action, Frank McCool first gained seasoning attending Gonzaga University during the war – a rarity for netminders of the day – with additional time spent with the Calgary Currie Army team after enlisting in 1942. Signing as a free agent with the Toronto Maple Leafs after returning from service in 1944, McCool would win 24 of his inaugural 50 games with the Blue and White, first leading them past the league-leading Canadiens in postseason play before a seven-game showdown with the Red Wings in the final. Setting the Leafs franchise record for most shutouts in the postseason with 4, McCool would be crowned a Stanley Cup champion as a rookie, culminating in a Calder Memorial Trophy win as the close of the season for his dominant performance. 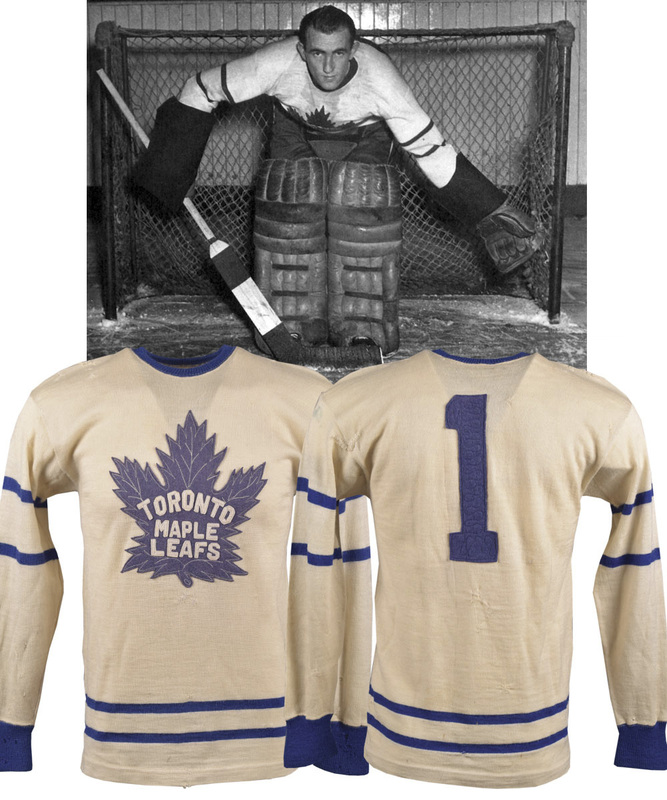 Hailing from his time with the Leafs and originating from the McCool family, we have a Leafs wool sweater that was worn by the netminder. Void of labeling and measuring-out across the upper reverse to roughly a modern size 42, a detailed Maple Leafs felt crest with white accent threading sits over the chest with “Toronto Maple Leafs” appliqued, with a deep blue felt “1” over verso, affixed through zig-zag pattern attachment. The familiar blue striping bands have also been utilized over the sleeves and waist. An LOA from Marie McCool will accompany this highly desirable Leafs wool. We should note that while the accompanying LOA states use during the 1944-45 NHL season, we were unable to confirm this attribution. The wool material remains soft, with the blue colouring deep, with the team crest clean and fully intact. A few small holes are noticeable over each sleeve and near the team crest, with over 25 team repairs visible, including over the front, reverse and sleeves, with larger examples over each sleeve.